The John Cusack thriller "2012" confirmed that moviegoers want a little doom and gloom with their popcorn. (Entertainment Weekly) -- Nothing like a good disaster movie to bring in a lot of coin at the box office. At least that was the case this weekend with Roland Emmerich's end-of-the world tale "2012," which took in an estimated $65 million stateside and an additional $160 million overseas. 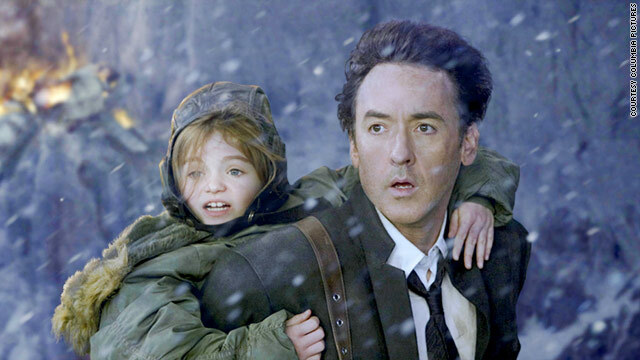 The John Cusack thriller brought in more than its $200 million budget in its opening weekend, a huge win for Sony Pictures. Add in the spectacular limited release reign of "Precious: Based on the Novel Push by Sapphire" and the weekend was a solid one even if it couldn't surpass last year at this time when Sony's "Quantum of Solace" was top dog on the list. In second place was Disney's "A Christmas Carol," which despite opening softly last weekend, held up well in its second weekend in theaters, dropping only 26 percent. The Robert Zemeckis, CG-animated film grossed $22.3 million, with 14 percent of its tally coming from IMAX's 182 runs. Its total cumulative now stands at $63 million. Third place belonged to the George Clooney-starrer "The Men Who Stare At Goats." Dropping an estimated 51 percent from last weekend, the film grossed an additional $6.2 million, putting its ten-day cumulative at $23 million. Fourth place was Lionsgate's "Precious," which continues to have one of the most astounding limited-release runs in box office history. Adding 156 theaters to its teeny opening weekend run, the Lee Daniels-directed film earned $6 million this weekend, for an incredible per-screen average of $35,000. The movie has earned close to $9 million in only two weeks in release. Slot number five belonged to Michael Jackson's "This is It," which lost a steep 61 percent at $5.1 million. The concert film/documentary has now earned $67 million in its three weeks in release and is set to stay in theaters through Thanksgiving weekend. The only other wide release to open this weekend was Focus Features' British import "Pirate Radio," which grossed outside of the top ten with only $2.8 million. Despite success overseas, the Philip Seymour Hoffman comedy didn't travel well stateside. That's it for the weekend box-office scoop. Come back next week when "The Twilight Saga: New Moon" is sure to have a record-breaking opening.